Myongji Hospital Chairman Lee Wang-jun (third from right) and Yulun Wang, InTouch Health founder and chairman, hold up the memorandum of agreement, at a signing ceremony at InTouch headquarters in Santa Barbara, Calif., last Monday. Myongji Hospital and leading U.S.-based telehealth firm InTouch Health have partnered to test out a telehealth system in Korea, dubbed the “Korean Telehealth” pilot project, the hospital said. 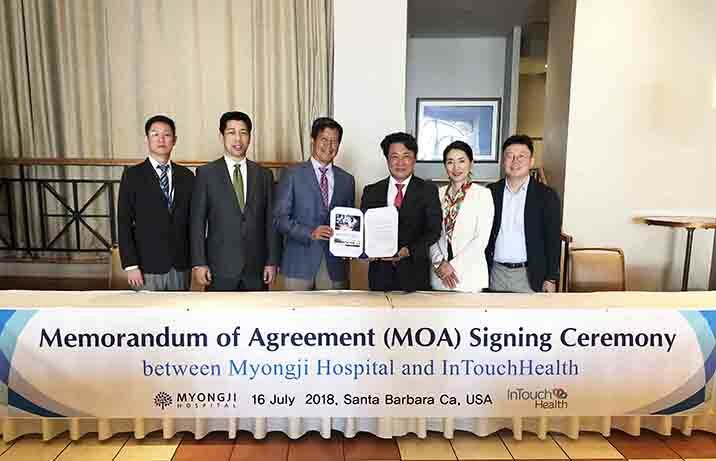 Myongji Hospital Chairman Lee Wang-jun and Yulun Wang, InTouch founder and chairman, signed a Memorandum of Agreement at InTouch Health headquarters in Santa Barbara, Calif., last Monday. Real-time telemedicine requires constant audio and video connection that does not disconnect, shake, or produce lags due to time differences. InTouch Health’s core technology is to connect live video and audio communications to a cloud-based platform, reducing the risk of these problems. Myongji Hospital will work to implement the technology developed by InTouch Health and create remote healthcare ecosystem by linking affiliated medical institutions and nursing homes, including Jecheon Myongji Hospital and Incheon Sarang Long-Term Care Facility. The Tele-ICU, Tele-Stroke, and Tele-ER systems will be the first to be implemented, Myongji said. To this end, InTouch Health officials will visit Myongji Hospital in September to discuss concrete implementation plans. Myongji officials will also cooperate with the U.S. firm to introduce its two telemedicine robots called the iRobot. “It took more than two years to implement Mayo Clinic and InTouch Health’s remote neonatal care program mainly due to a large amount of effort required to persuade medical staff and creating a protocol,” Chairman Lee said. “The implementation of Korean-style telehealth will also require the cooperation of medical staff participating and the institutional support of the government." InTouch Health is a leading telehealth firm that operates telehealth systems with top-tier hospitals and clinics such as the Mayo Clinic and the Cleveland Clinic. It recently opened a Telehealth Forum to the attendance of medical and IT professionals from all around the world, according to Myongji.